Ever look back at old haircuts from the 1980s and wonder how anybody could have left the barbershop with a straight face? That’s the way I look at LINK, and at the idea that it was ever sold as a horror film. LINK is a fun movie to watch, but not on its own terms. 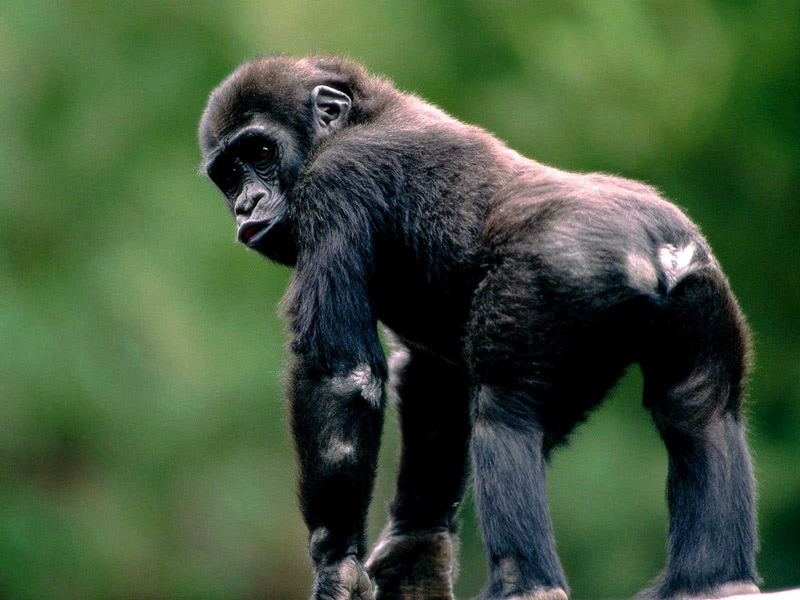 It’s a movie that asks an audience to be afraid of chimpanzees. That’s a lot to ask of an audience. The eternally-lovely Elisabeth Shue, then fresh off THE KARATE KID, plays an American college student living abroad in England, where the movie was made. She is hired by an eccentric professor — played by SUPERMAN 2’s Terence Stamp, who is also eternally-lovely — to help out at his lab for the summer. The lab is located a small summer home, which is situated on a cliff high above the coast, with a seaside view, and it is there that the professor studies the behavioral patterns of a group of super-smart chimpanzees. The smartest of the bunch is a fellow named Link, who wears butler clothes and roams about the house freely. Now, there’s something I haven’t told you. LINK is about chimpanzees, this much is true. But the title character is actually played by an orangutan. His naturally orange fur has been dyed black, or, as it turned out, a sickly shade of brown. 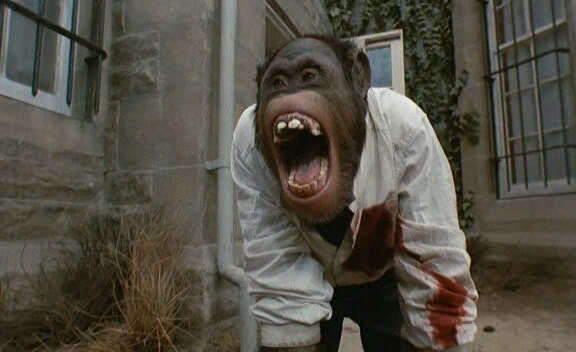 I get it, it’s a safety issue, chimpanzees are dickheads, one of ‘em bit off poor Jennifer Connelly’s finger during the making of PHENOMENA (true story, maybe), but still: We’ve all seen PLANET OF THE APES. We know the difference. Don’t give us Dr. Zauis and then tell us he’s the lady one who kept calling Charlton Heston “Bright Eyes.” It’s insulting to everyone involved. That’s it. That’s the story. In as many words, I’m telling you that LINK is a movie where, for a significant amount of its running time, the only living beings onscreen are Elisabeth Shue and a small group of super-smart chimpanzees (orangutans). If you’re even remotely like me, there can’t be any more encouraging cinematic prospect on paper. In 2014, Elisabeth Shue is still incredibly cute (and definitely still deserves to be a much bigger star), but LINK has her at 23. And I can’t pretend to get all sophisticated about it – for me, that’s kinda enough. Show me apes in suits and a pretty girl and I will have to strain to complain. LINK was directed by Richard Franklin, who was a protégée of Alfred Hitchcock, to the point that Franklin was the one who directed PSYCHO 2. It was written by Everett De Roche, who also wrote 1981’s much more awesome ROAD GAMES for Franklin. These are not untalented men, not by a long shot, but with respect I must suggest this is not their best work. LINK has a bizarre, unnatural rhythm that seems to be primarily due to some ill-considered pacing, but it could also have a lot to do with the fact that it’s a would-be suspenseful movie that relies heavily on animal actors. That means that a human character will speak a line of dialogue, and then have to wait for the trained orang’s reaction. That all happens in real time on film. Lest I start sounding too critical, there are other things you need to know. 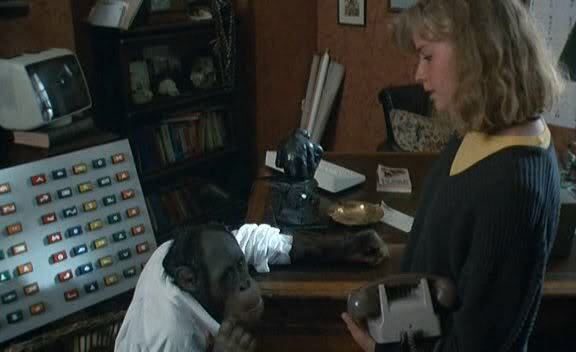 There is a scene where a perverted chimp (orangutan) stares at Elisabeth Shue as she prepares to take a bath. There is a climactic exploding cigar scene. A climactic exploding cigar scene. 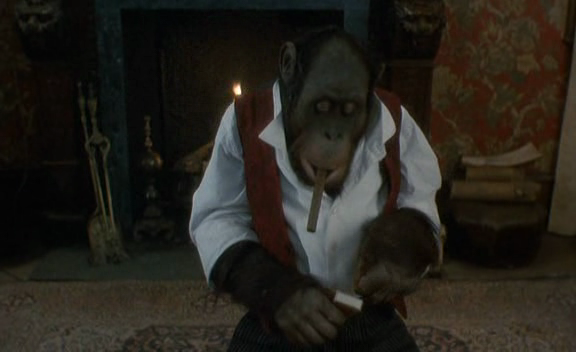 I’m also pretty sure that there are a couple scenes where little people in ape costumes double for the ape actors. These are all moments that make me glad that I witnessed this movie. GAROTA BOAZUDA IGUAL CUMUS AI ESSA DA ELIZABETH DA SHUES, COM UNS RABO GORDO E LINDO COMOS O DELA, MERECE POR DEMAIS MESMO SER DE VIVER ENTRANDO SEMPRE BEM FUNDO EM UMA ROLA GROSSA E MUITO GRANDE!.